Thanks to Dean C. Axtell for these pictures from August, 1998. That's Dean and Clay in the pictures. The green building really is the post office. 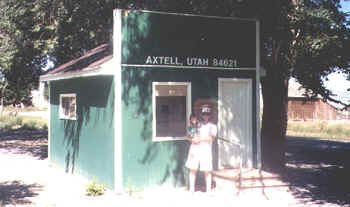 The painted plywood sign says Axtell, Utah at the top. After driving across some of the most desolate, yet strangely beautiful, country I've ever seen, we finally found civilization in Salina, Utah. From there it was just a short drive north to beautiful Axtell, Utah. The anticipation mounted as we got closer. 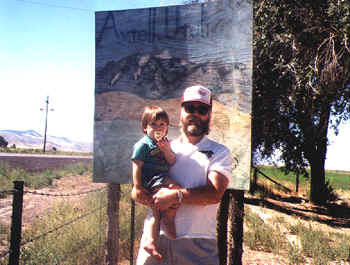 Finally, there it was, an oasis springing up from the Utah badlands--Axtell! Only about 150 to 200 people live in Axtell. There is a post office, a Mormon church, and a few signs. That's about it. However, while sightseeing, we came across a place with a sign on a fence that read: "Grandmasaurus' Durastic Park". How could we pass that up? So we stopped in and met Bernitta Meekum (spelling?). 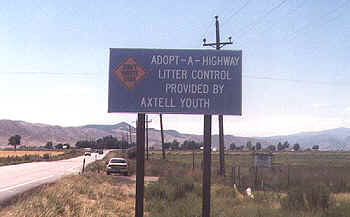 Ms. Meekum said her mother's sister married Ellis Axtell who owned Axtell Chevrolet in Logan, Utah. She said Ellis passed away a couple of years ago. It was Ms. Meekum who told us the population of the community is around 150 to 200 people. She said many in the community work (versus reside) at the prison a few miles to the north in Gunnison. I asked her how the community got its name. She said there are two or three stories she's heard. But the only one one she could remember is this one: She said one of the first settlers was a man named Axel Innerson. 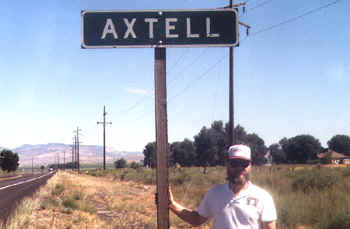 I asked if the community may have been named after Governor Axtell. She said she didn't know. The next day we stopped at Axtell Chevrolet in Logan, Utah. We spent a few minutes visiting with Thomas J. Axtell, vice president of the company. 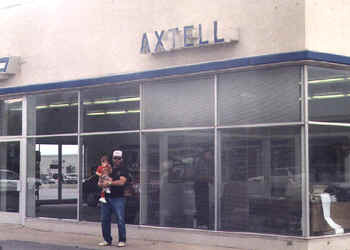 He and his brother now run Axtell Chevrolet since their dad, Ellis passed away a couple of years ago. back to Places named Axtell.